1. De Rosa SC, et al. Vaccination in humans generates broad T cell cytokine responses. J. Immunol. 173:5372, 2004. 2. Harari A, et al. Skewed representation of functionally distinct populations of virus-specific CD4 T cells in HIV-1-infected subjects with progressive disease: changes after antiretroviral theraphy. Blood 103:966, 2004. 3. Betts MR, et al. HIV nonprogressors preferentially maintain highly functional HIV-specific CD8+ T cells. Blood 107:4781, 2006. 4. Duvall MG, et al. Polyfunctional T cell responses are a hallmark of HIV-2 infection. Eur. J. Immunol. 38: 350, 2008. 5. Ferre AL, et al. Mucosal immune responses to HIV-1 in elite controllers: A potential correlate of immune control. Blood 113:3978, 2008. 6. Sun Y, et al. Magnitude and Quality of Vaccine-Elicited T-Cell Responses in the Control of Immunodeficiency Virus Replication in Rhesus Monkeys. J. Virol. 82:8812, 2008. 7. Day CL, et al. Detection of polyfunctional Mycobacterium tuberculosis-specific T cells and association with viral load in HIV-1-infected persons. J. Infect. Dis. 197:990, 2008. 8. Darrah PA, et al. Multifunctional TH1 cells define a correlate of vaccine-mediated protection against Leishmania major. Nat. Med. 7:843, 2007. 10. Hallengärd D, et al. Comparison of plasmid vaccine immunization schedules using intradermal in vivo electroporation. Clin. Vaccine Immunol. 18:1577, 2011. 11. Gazagne A, et al. 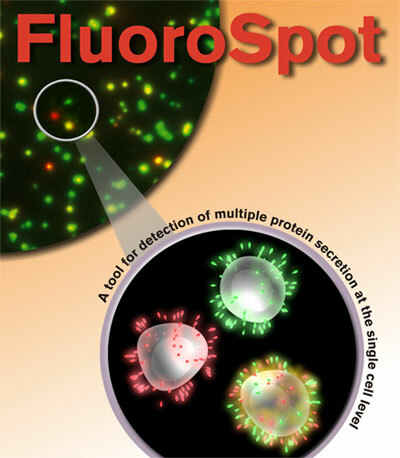 A Fluorospot assay to detect single T lymphocytes simultaneously producing multiple cytokines. J. Immunol. Methods 283: 91, 2003. 12. Casey R, et al. Enumeration of functional T-cell subsets by Fluorescence-Immunospot defines signatures of pathogen burden in tuberculosis. PLoS One 5 (12): e15619, 2010. 13. Rebhahn JA, et al. Automated analysis of two- and three-color fluorescent Elispot (Fluorospot) assays for cytokine secretion. Comput. Methods Programs Biomed. 92:54, 2008. 14. Currier JR, et al. A panel of MHC class I restricted viral peptides for use as a quality control for vaccine trial ELISPOT assays. J. Immunol. Methods 260:157, 2002. 15. Smedman C, et al. FluoroSpot analysis of TLR-activated monocytes reveals several distinct cytokine-secreting subpopulations. Scand. J. Immunol. 75:249, 2012. 16. 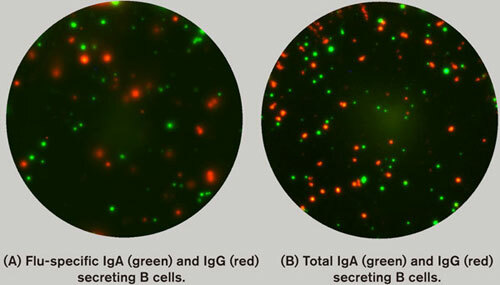 Kesa G. Comparison of ELISpot and FluoroSpot in the analysis of swine flu-specific IgG and IgA secretion by in vivo activated human B cells. Cells 1:27, 2012. 17. Quast S, et al. 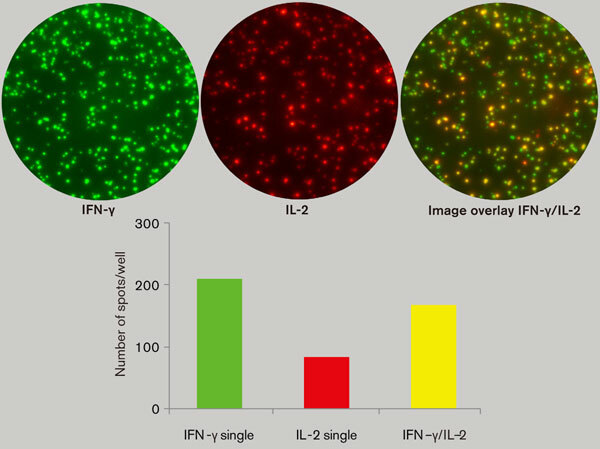 IL-2 absorption affect IFN-γ and IL-5, but not IL-4 producing memory T cells in double color cytokine ELISPOT assays. Cell. Immunol. 237:28, 2005.